I was going to name my blog Cowboy Quilter after my passion for horses, westerns and colorful cowboy fabrics. But since they are just a small part of what I make I thought Constant Quilter fit me better. I have an extensive collection of vintage cowboy fabrics and feedsacks. This is my favorite quilt made from some of my collection. It is a tribute to my childhood friend Trigger and his pal Roy. This one has nothing to do with cowboys, but you can't think of Texas without thinking of them. I made this for my cousin's wedding last week. She works for Texas A&M and has lots of red in her kitchen. 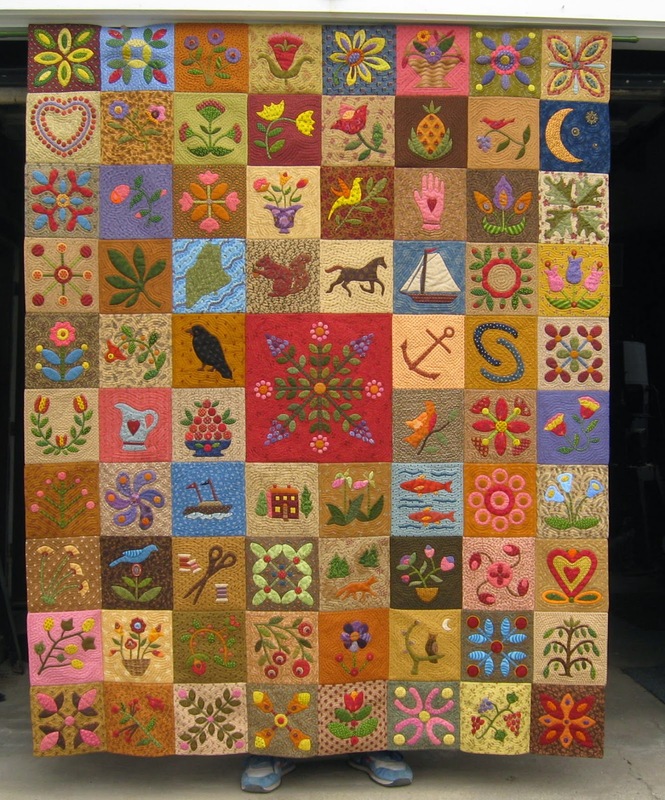 Cyndi and I are off to the New England Quilt Museum in Lowell tomorrow to see the RI quilts. Hope to post some great photos. Sorry, Pam's paper was published in the 2010 (not 2011) Uncoverings. My how time flies! But I recommend all Uncoverings to anyone interested in quilt history. 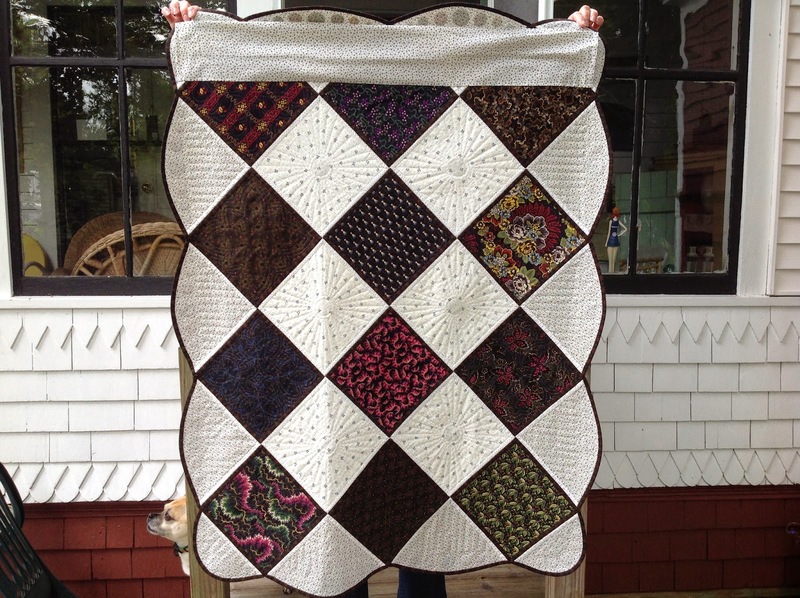 Here is a photo of my latest pot holder quilt, "Pan Blackened Applique". This one will be at A Quilter' Gathering IN Manchester, NH the first weekend in November. Love that show! I like to make the backs interesting too. Here's a close up. The corners on the scallops were tricky but I love the outcome. I try to make some sort of cooking reference in their titles. Ironic that I like the pot holder method so much since I hate to cook! I am on my 12 pot holder now. Some nut who shall remain nameless (Pam Weeks) challenged me to make a Dear Jane in the pot holder method and my dear friend Cyndi enabled me by finding me the perfect background fabric so... I have 52 blocks done so far. Photos to follow. 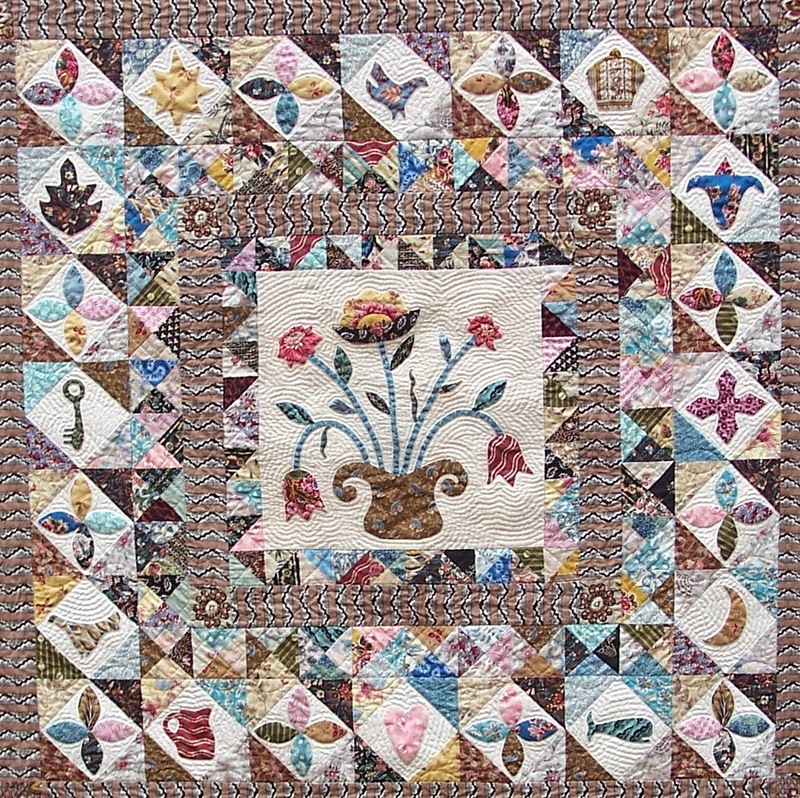 This post is for Kathie at Inspired by Antique Quilts (one of my favorite Blogs). 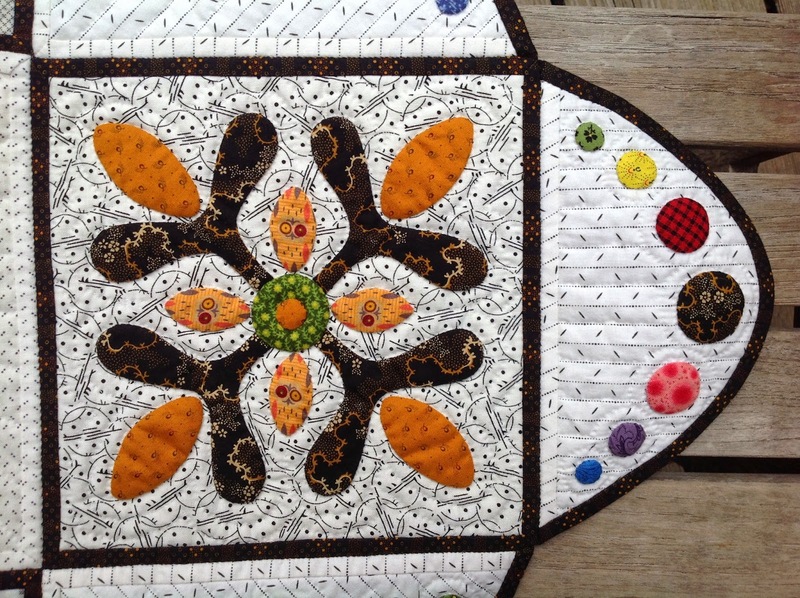 She and my dear friend Cyndi from the Busy Thimble have encouraged me to start this Blog and Kathie asked for some of pot holder quilts so here are a few. 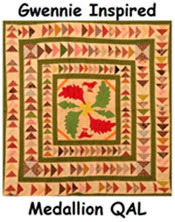 For information on pot holder quilt history, I highly recommend the book Civil War Quilts by Pam AKA Pot Holder Pam) Weeks and Don Beld. This one, "No Bake Applique" is headed for the AQS Quilt Show in Des Moines. The feet don't come with the quilt, but I am lucky to have a tall husband! I designed all the blocks one at a time. There are seventy six 8" blocks and one 16" in the center. 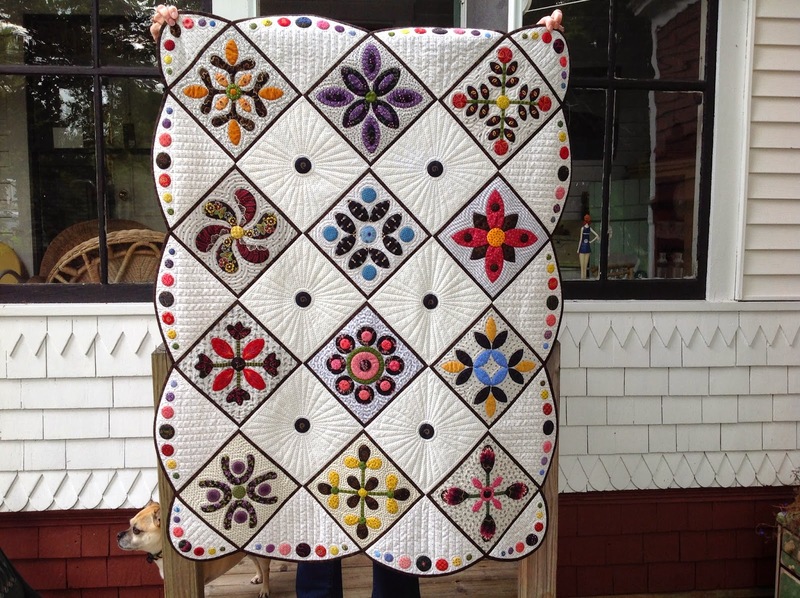 For those of you new to this term, a pot holder quilt is made from individually quilted and bound blocks and then whipped together to for the quilt. As I mentioned Pam's book goes into history detail on ones made during the Civil War. She also wrote a wonderful paper on the Pot Holder method and presented it at the 2011(I think) AQSG seminar. You can order the Uncoverings 2011 edition from AQSG. Here's a close up of this one. there's no stopping me now! I promise you won't see any non quilting related posts from me. 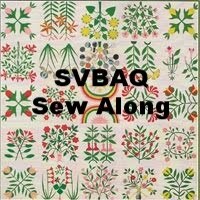 This is strictly a way for me to share some of my work with all of you who have been so generous in sharing your wonderful quilting adventures. I don't do any other social media so I hope I can be consistent in posting without taking up too much of my quilting time. 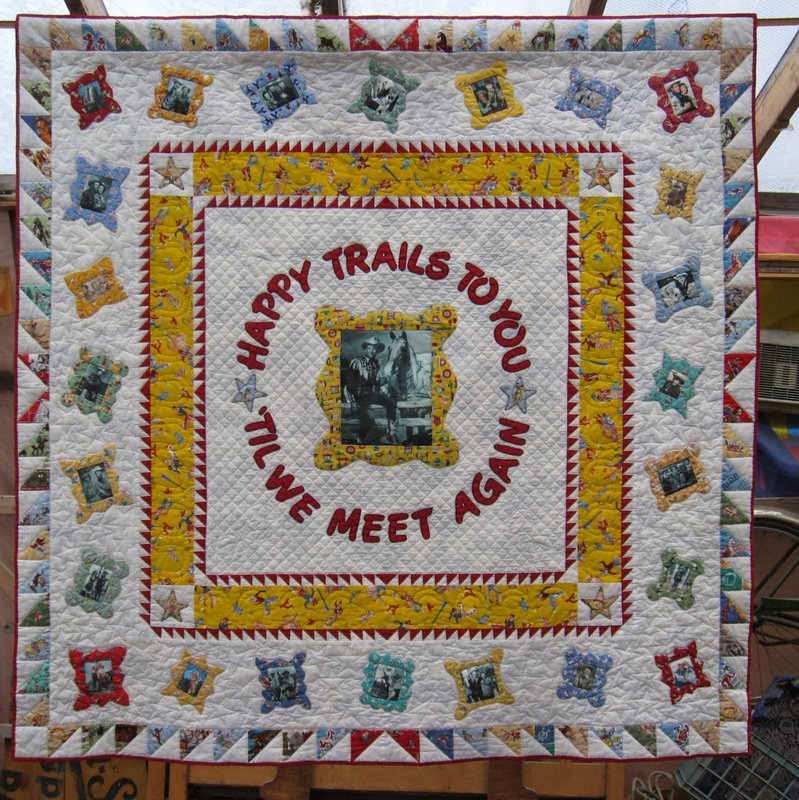 I still work full time outside of my home so, as with many of you in Blogland, my quilting time is precious. Here is a photo of a little quilt I made this spring with 1" hexagons and that fabulous Dutch print border. It won Judges Choice at our show in Maine in July. I have never liked hexagons that much but I got hooked while on a long weekend trip and I just can't seem to stop making them! This is all English pieced and hand quilted. I do appreciate everyone's patience (including mine) as I attempt to insert a photo on my own! 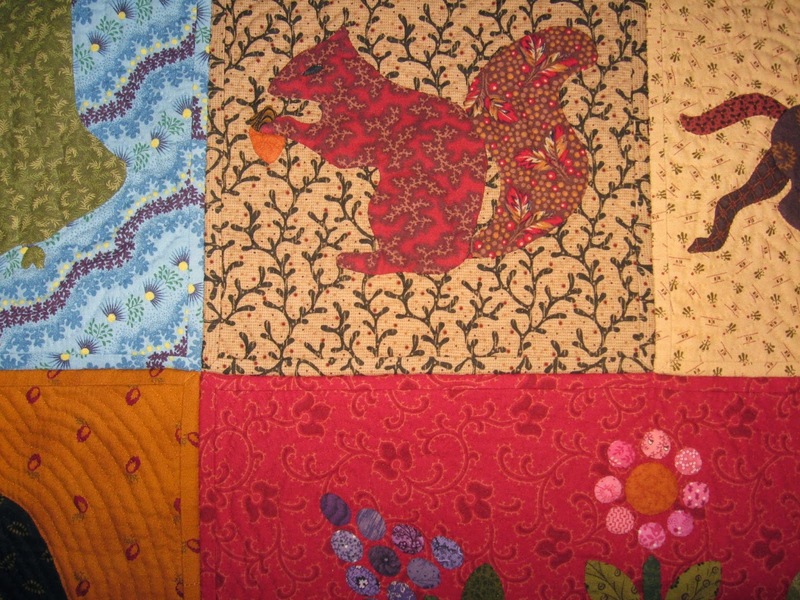 This is the center of a quilt I made some years ago. I wanted it honor my English heritage as well as my Maine heritage. Well, it appears that yesterday's post did work so I will try something else today. I feel like I may have finally entered the 21st century. I just hope blogging lasts long enough for me to get the hang of it. I thank everyone in advance for your patience. My New Year’s resolution (yes last January) was to start a blog. So… after reading so many wonderful blogs over the past few years, here is my attempt. 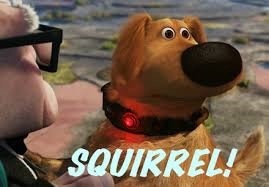 I do hope people will be patient with me as I fumble my way through cyberspace. I am so very technologically challenged that I hope I can figure this out and find a way to enjoy the process.